Blade fuse boxes complete with transparent cover and terminal locking bar.The cable connections are made using the 6.3mm male blade terminals which are fitted on the underside of the fuse box. 8 way blade fuse box complete with transparent cover and gasket which is designed to be inserted into a panel. The cable connections are made using the 16 x 6.3mm male blade terminals which are fitted on the underside of the fuse box. Dimensions 42mm (H) x 115mm (W) x 30mm (D). Pack sizes 1, 50, 300. Blade fuse boxes complete with transparent cover and gasket. The cable connections are made using the 6.3mm male blade terminals which are fitted on the sides of the fuse box. 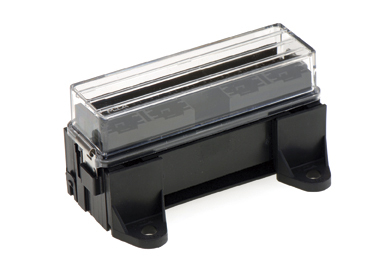 16 way blade fuse box complete with transparent cover, gasket and terminal locking bar.Supplied with 32 terminals for crimping cables 1.0mm² to 2.5mm². 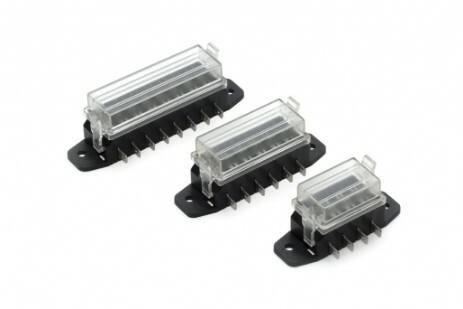 The female push-on terminals provided are crimped onto the cables, these are then inserted underneath the fuse box and are firmly held in place using the terminal locking bar. This fuse box can be clipped together with another box or boxes to form a 32 or 48 way unit. 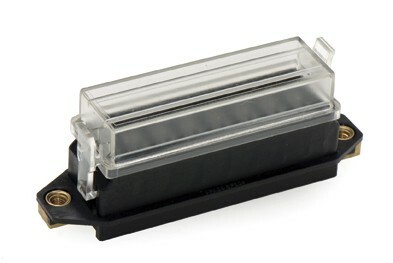 FBB16U can also be clipped together with the 4 and 7 way relay boxes (RB4U and RB7U) to form a single integrated unit. Dimensions 64mm (H) x 135mm (W) x 42mm (D).